Mizuna is one of those strange oriental vegetables which arrived in the West in the last 20 years or so. However, even if we aren't sure what to do with them, at least mizuna greens are decorative, adaptable, very vigorous and cold tolerant. As they have a long growing season, they can be used as an attractive edging to vegetable or flower beds. Mizuna is also useful for undercropping sweet corn, or grown as a seedling crop for intercropping. 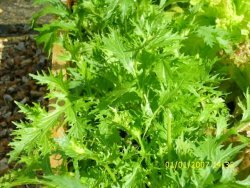 Mizuna can be grown to use either as mature plants or as a seedling crop. The first cut of seedlings can sometimes be made two or three weeks after sowing. Where mature plants are grown, forming clumps about 22cm (9") high, keep cutting regularly to produce a continuous crop of small young leaves. For the mature and semi-mature crop sow successionally in rows 30cm (12") apart from mid June to the end of August (either direct or in modules). Mizuna can also be sown under cover in mid-September for winter use. Thin according to the eventual size of plant required: small plants 10cm (4") apart, medium plants 20-22cm (8-9"), large plants 30-45cm (12-18") apart. Clumps can often be cut four or five times before they run to seed. Young leaves are used raw, older leaves are best lightly cooked.